Over the course of the last 100 years or so, the main access between the Tipton Road and Dudley Port has been this single Lane in two parts which passes underneath the Birmingham mainline canal and the railway line between Wolverhampton and Birmingham. A tunnel continues the Right of Way across a tributory of The River Tame onto Sheepwash Local Nature Reserve and then into the Tipton arm of John’s Lane. The entrance to John’s Lane via a Rhodia barrier gate. It is difficult to explain (not least when reporting pollution incidents to the Environment Agency), that two separate roads not connected by any apparent highway are indeed part of the same road. Unfortunately like most things in the area this is the result of bad planning. John’s Lane has changed its face over time, which in the context of The Rattlechain Lagoon story is a fairly crucial chapter. The access to the site, other than via the canal dumping episode, has always been via this single entrance. 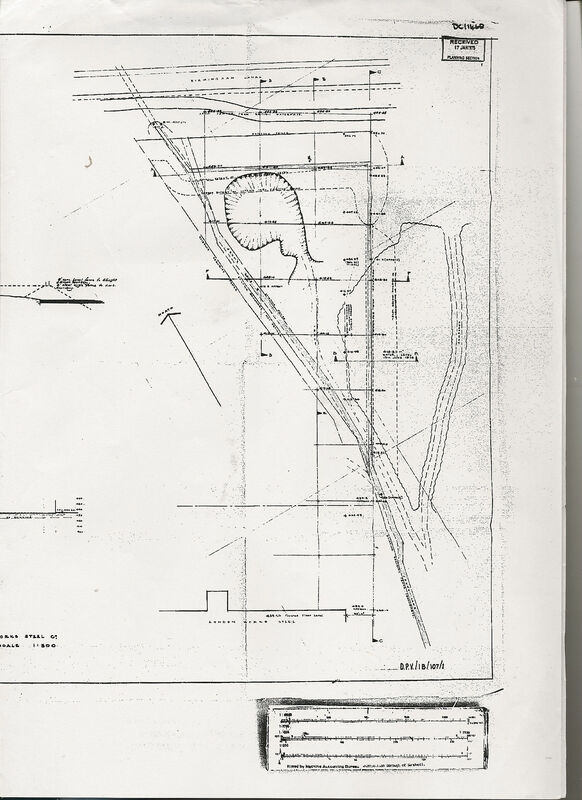 It has become clear to us via investigation that not only did the Albright and Wilson owned site boundary along this route change, but so have the ground levels of the road itself, as has the Right of Way which used to run through land owned by the Vono Company, then later Duport Properties Limited and London works Steel, which in turn became part of The Autobase Industrial Estate. 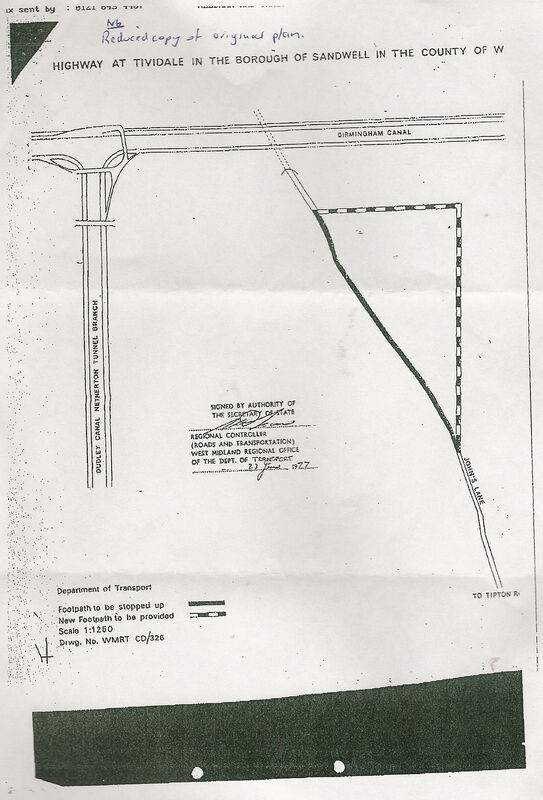 The current route only dates from 1977, when an order to divert the accessway was approved as part of a planning application by Duport Properties Ltd who wished to extend the boundary of their land to form a squared off plateux. 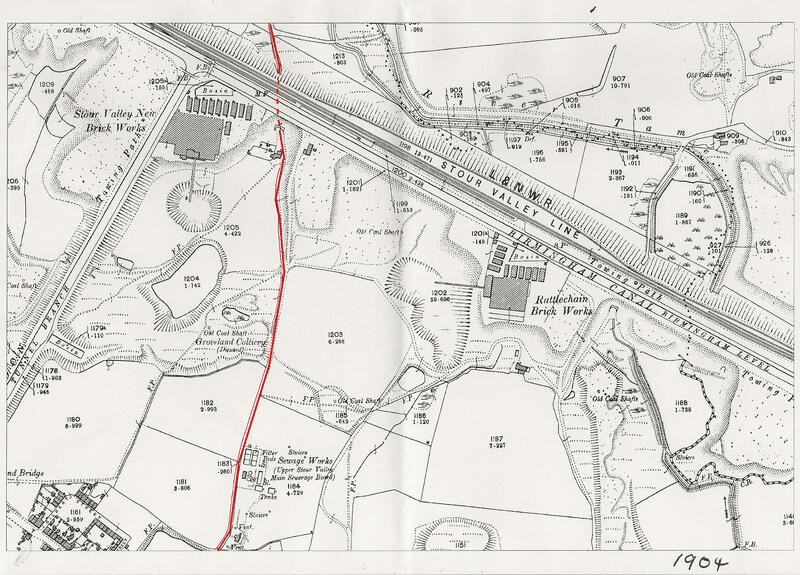 A 1904 map confirms that John’s Lane passed between the rattlechain brickworks pit and the Stour Valley brickworks pit. 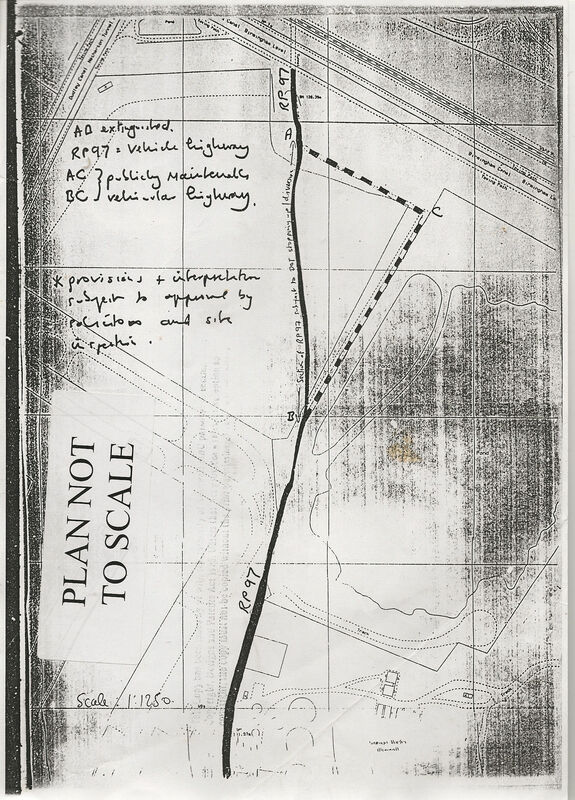 The above planning application from 1954 numbered 216 shows how the whole area of the Rattlechain brickworks pit and the adjacent claypit were used as “tipping areas”. John’s Lane bisected the two sites. The boundaries although fairly loosely defined over this period, and probably fairly poorly secured judging by the anecdotes of youths playing in both areas, were really only defined by the John’s Lane route itself. It was clearly obvious that Albright and Wilson and their Western neighbours were prone to doing landswap deals for mutual benefit. 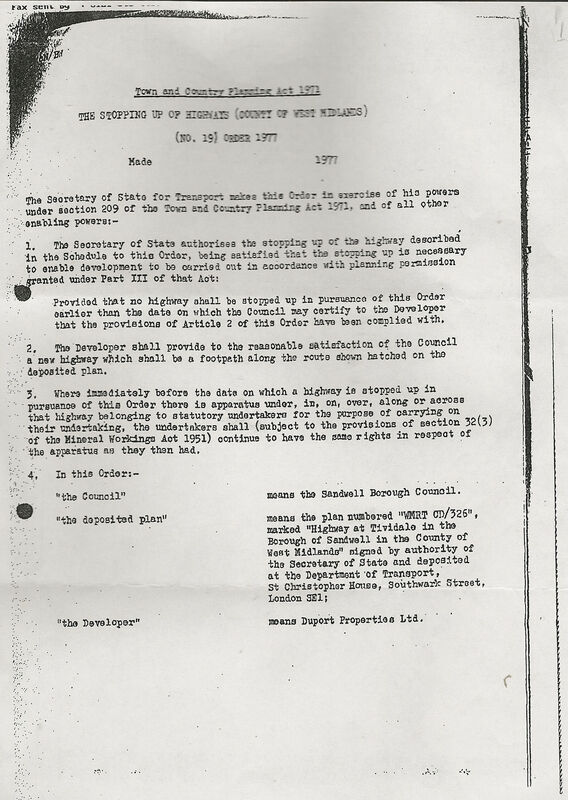 A 1961 planning application numbered 3289 to extend the rollingmill involved moving the boundary of the two site ownerships, though not it seems diverting the right of way which instead of forming a boundary, now passed through the Vono site . 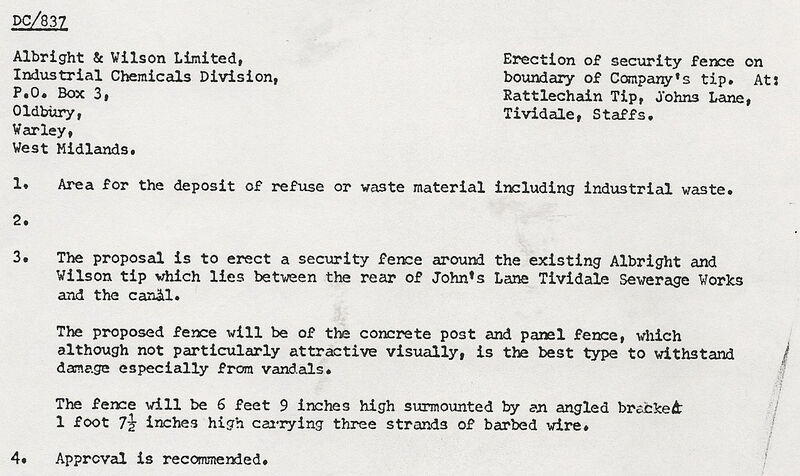 This therefore confirms that Albright and Wilson owned land up to John’s Lane at this time, which in turn is likely to have been heavily contaminated with material which had been tipped for well over a decade “since 1942” into the former rattlechain brickworks clay pit. At this point there was only one single pool,(the former claypit) that was being used for chemical dumping by Albright and Wilson. 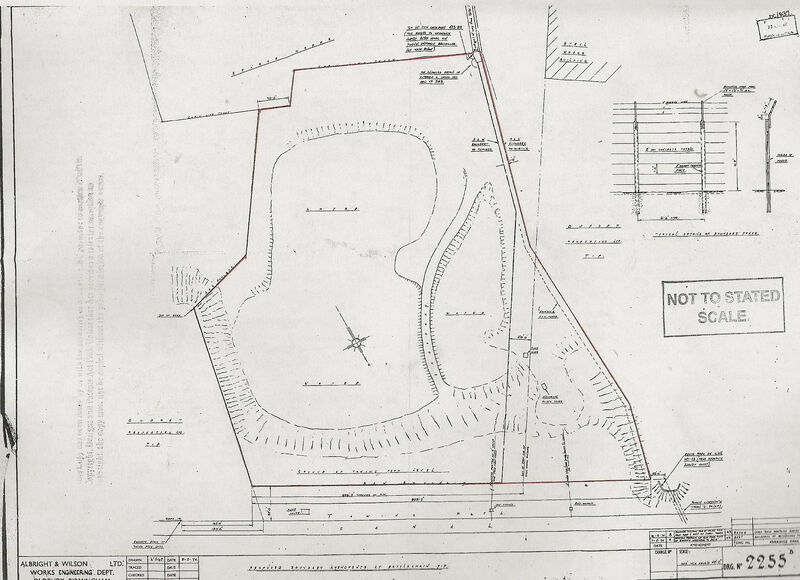 The plan below shows the proposed new site boundary line between the Vono and Albright and Wilson land, with the John’s Lane right of way now passing through the Vono owned land. 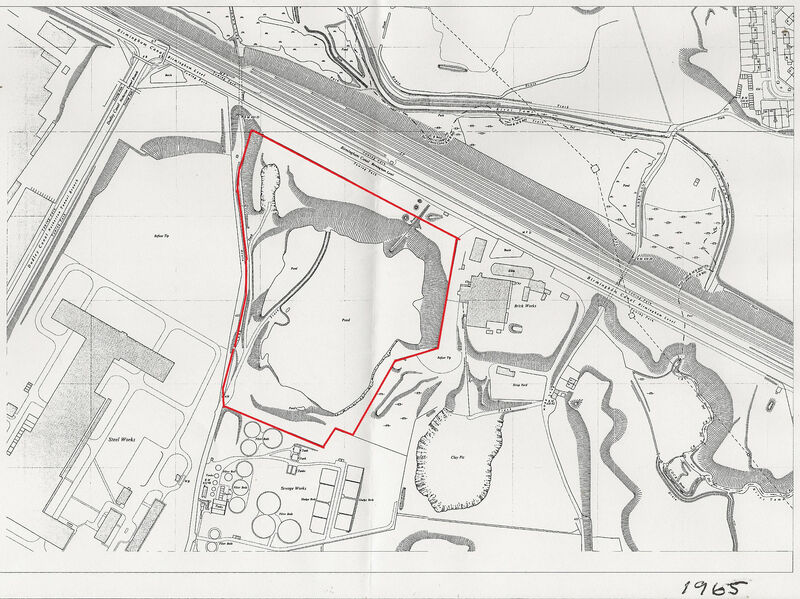 Not shown on this plan is the figure of 8 pool (Vono lagoon) formed by merging the former Stour valley brickworks claypit and the former Groveland colliery pit below it. It is evident that as a direct consequence of this landswap, that the subsidiary lagoon on the Albright and Wilson site was then created. 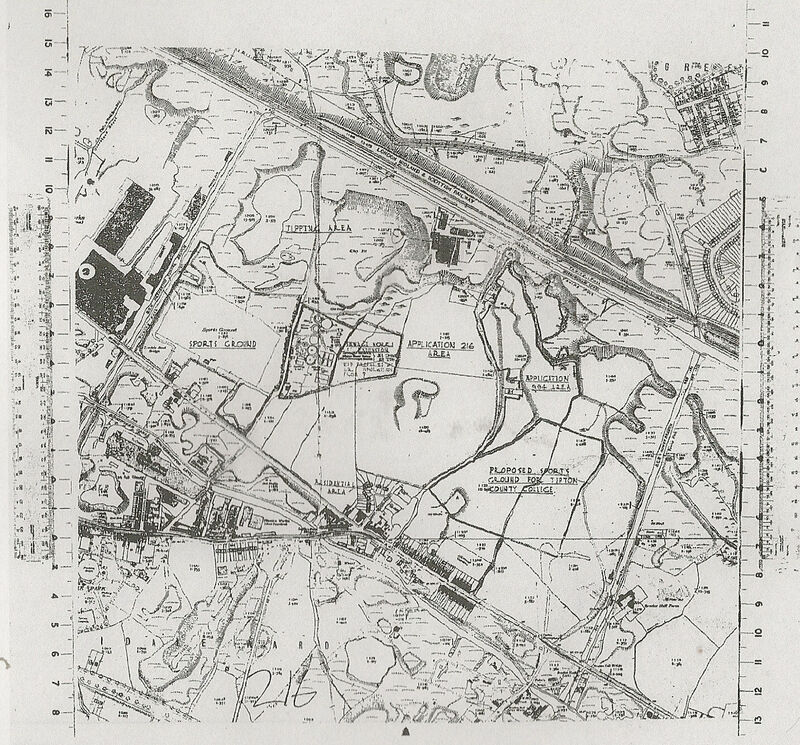 The 1965 map shows the state of the two lagoons and site boundary. 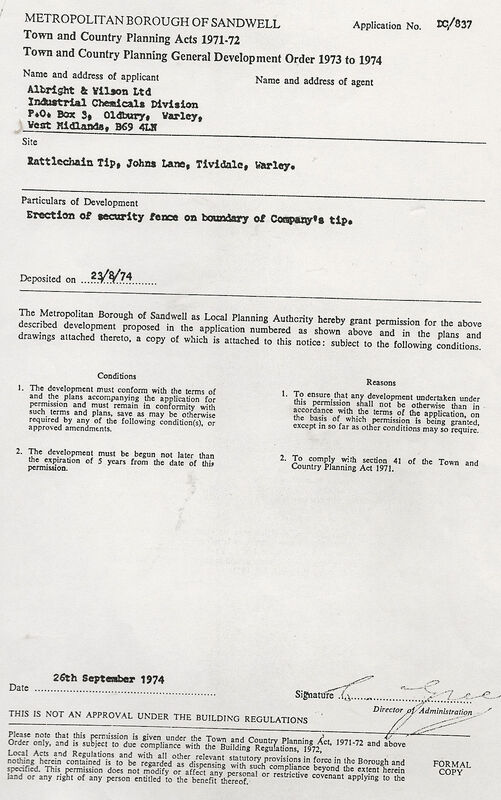 Further land appears to have been needed thereafter by London Works Steel. 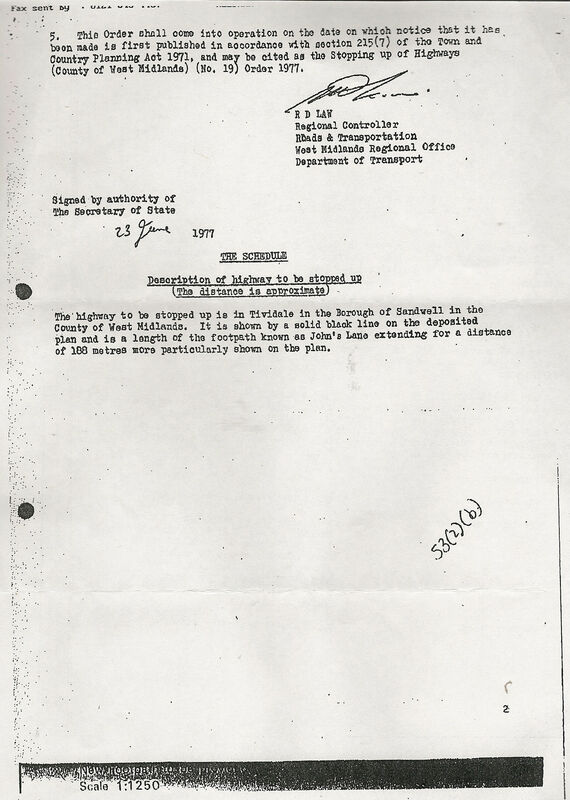 The following letter from 1971 indicates that John’s Lane itself was raised by two feet. 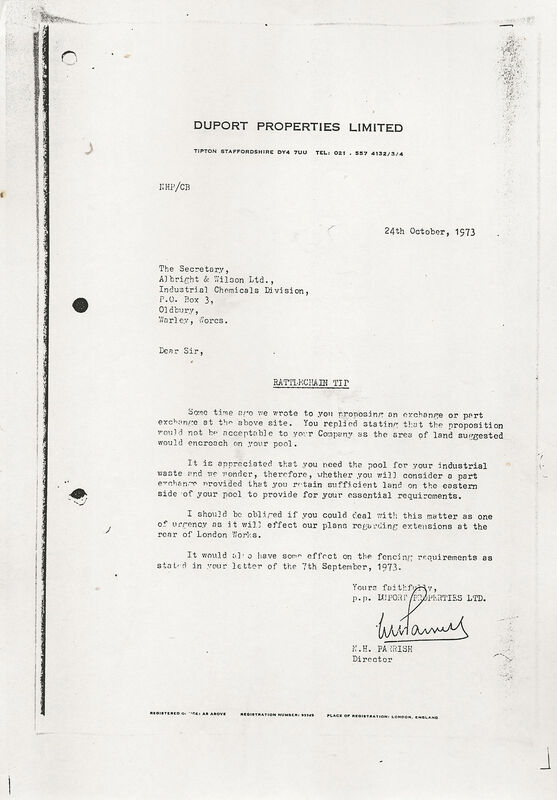 The following letter from Duport Properties Limited from 1973 confirms that this company had for some time been pursuing Albright and Wilson for a further land aquisition. 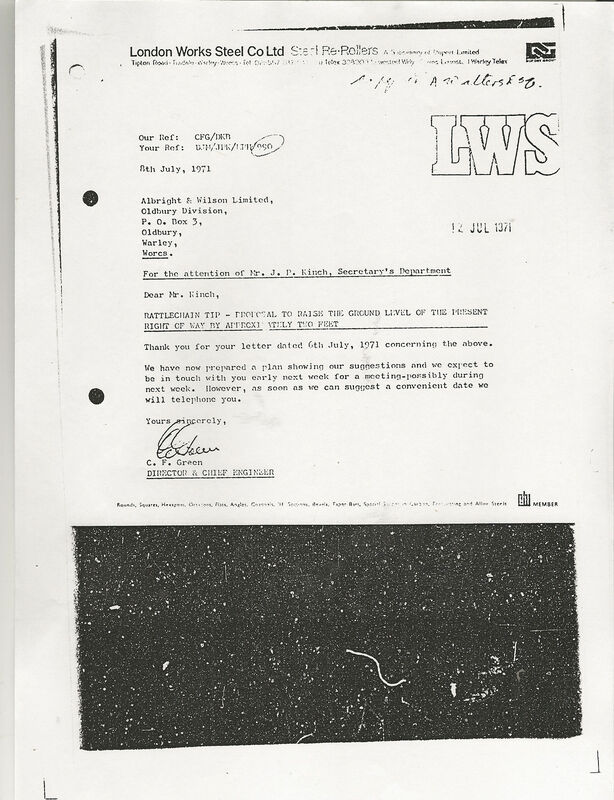 This letter refers to “The Eastern side” of their pool, presumably refering to the subsidiary lagoon, which at this time was still shaped in a distinctive kidney shape. 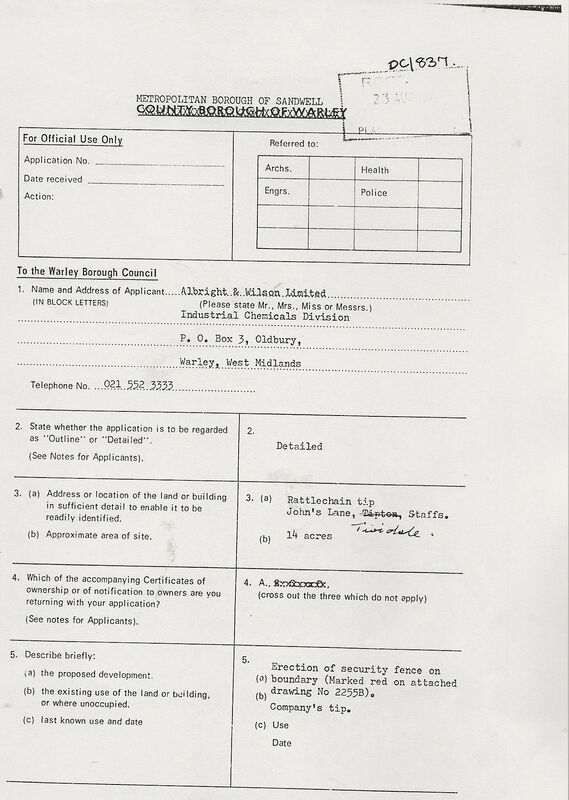 The following planning application DC/837 was subsequently submitted by Albright and Wilson in August 1974. By this time changes in legislation were starting to bite concerning The Control of Pollution Act. Before a site licence was granted however, Albright and Wilson and Duport Properties Limited between them manged to evade any scrutiny concerning waste materials deposited between their two sites, by the latter gaining some of the Albright and Wilson land. The information contained here, especially regarding history is extremly limited. 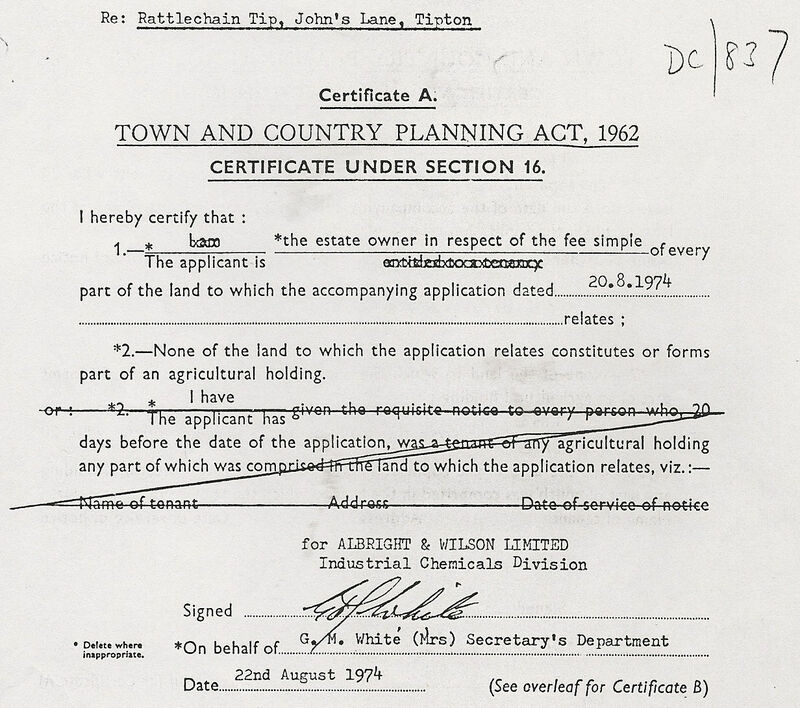 The following confirms that Albright and Wilson were landowners of the site to which they were fencing off at this time, given that no form B is submitted with the application by them. 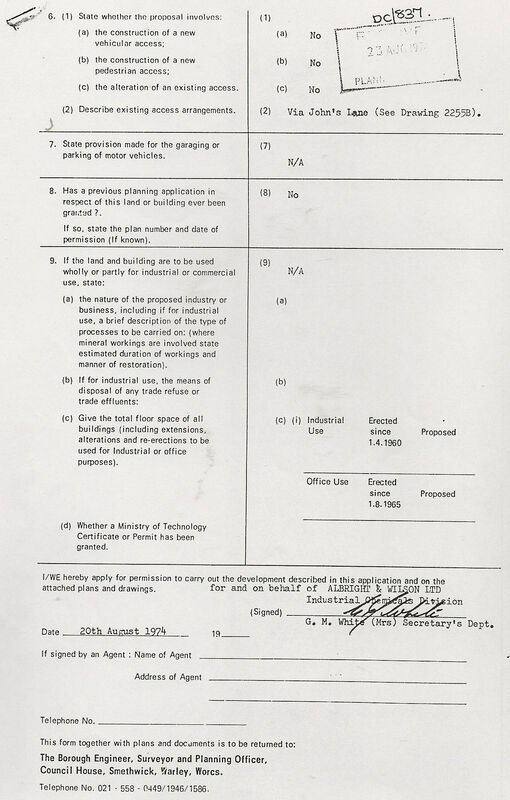 The application was approved on 26th September 1974. The plan below shows several key features of the rattlechain lagoon site before licensing came into effect, including the AW boundary Line with measurements. 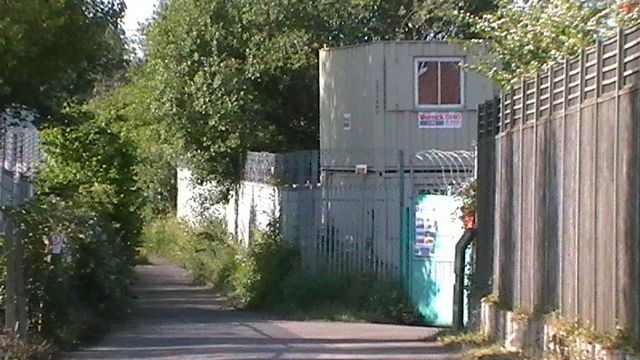 Most notable is the extent of the land to the West in their ownership which is virtually up to the John’s Lane tunnel. 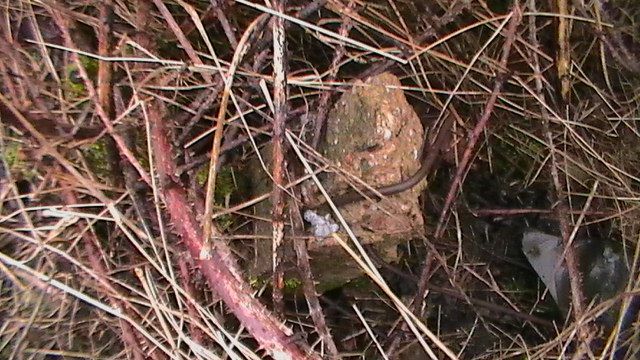 A large depression, possibly a part excavation, or even a remnant from the canal breach of 1899 is apparent. 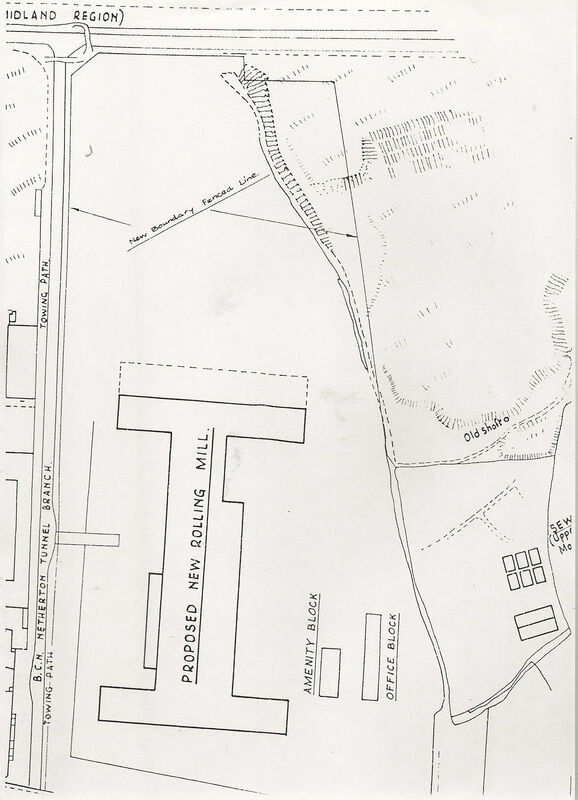 Marked on here are a pumphouse and electrical switch house ,(now both off site and on the Autobase owned land), and an indication that a different discharge point to The Birmingham Canal was being used at this time. Also marked are the canalside pumphouse from where waste was still being discharged to at least 1972. 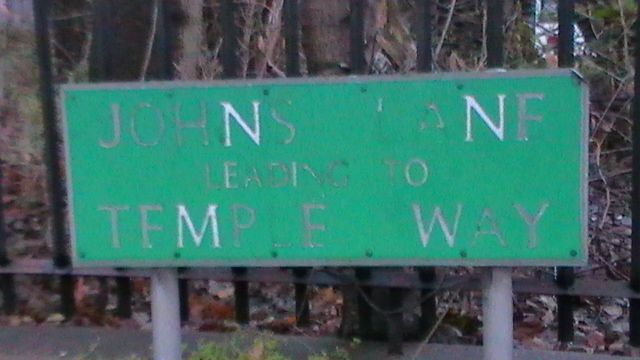 John’s Lane is marked as the boundary of the AW land, though it appears that the whole land is still within their ownership up to this point. This appears to indicate that the exact area of land in application 3289 for transfer to Vono from AW had not in fact been completed. We also have confirmation that Duport Properties Limited were operating as owners of Land on both sides of the Rattlechain lagoon site at this time. 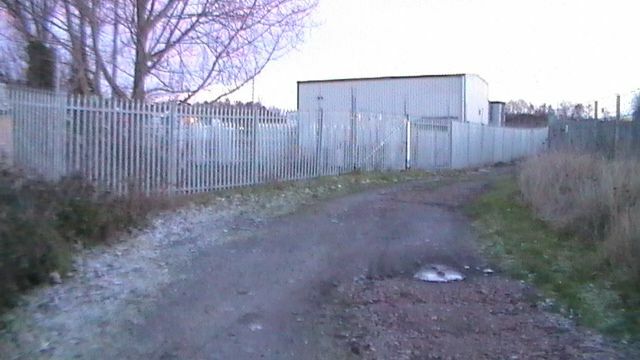 This period would see this company operating in the most shambolic waste tipping operation on both sides of the Albright and Wilson site, neither it appears without any legal mandate of a planning permission to do so. 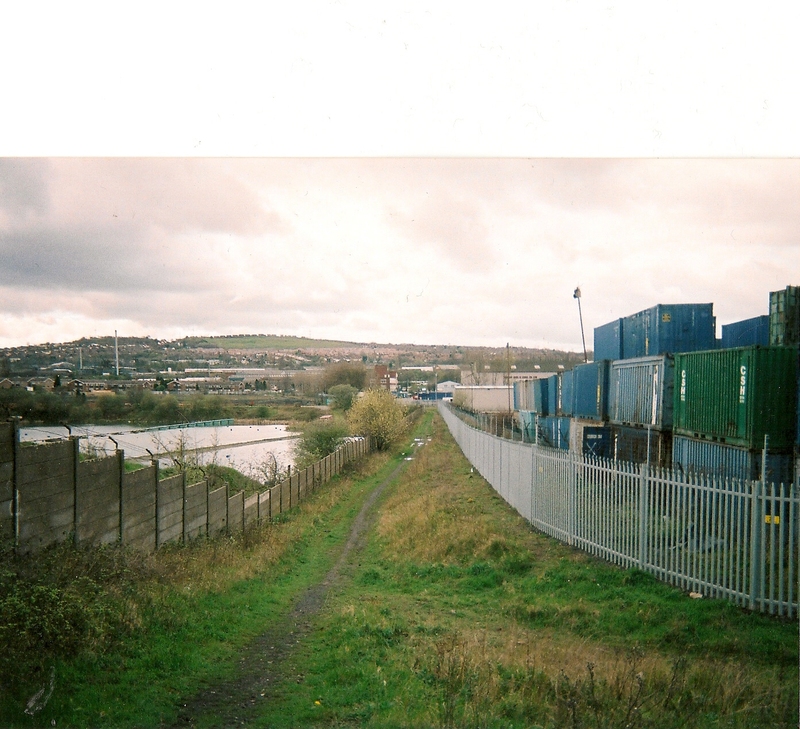 THERE ARE NO PLANNING RECORDS WHICH CONFIRM THEIR RIGHT TO TIP ON THE EASTERN SIDE OF THE LAGOON, THE AREA OF THE FORMER RATTLECHAIN BRICKWORKS. 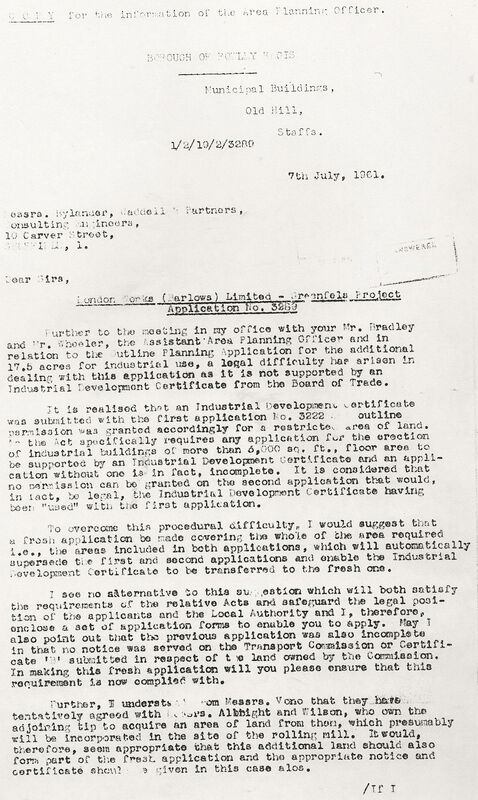 Crucially however they do not give any form B notification to Albright and Wilson, indicating that after their application had been approved in 837, the Langley company had sold or offloaded part of this land to Duport Properties Limited. It is fairly evident that there appears to have been some rather insidious collaboration here with these planning proposals between the two companies. 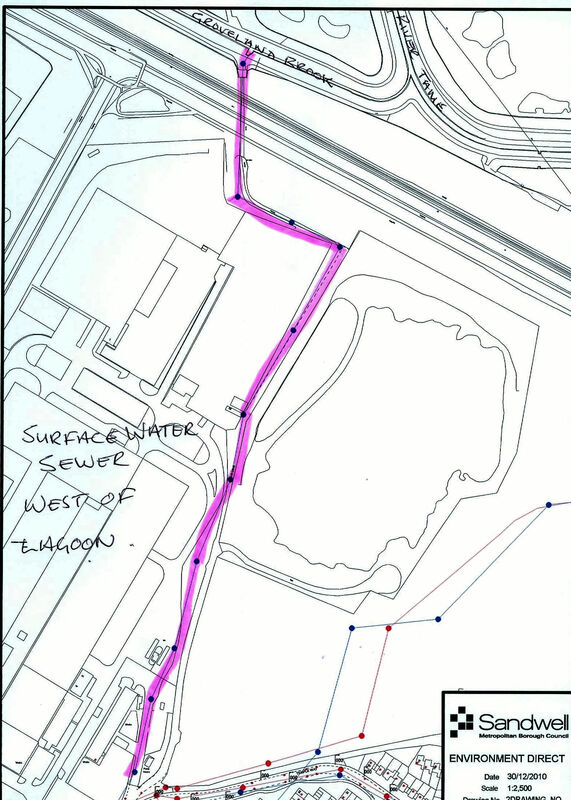 The Right of Way at John’s Lane however was a problem that needed to be diverted, as these following officer observations confirm, together with a mention of Albright and Wilson’s chemical waste pool being part of the proposed site change. There is no consideration given however to contamination issues, which is perhaps why these proposals were submitted at the same time shortly before greater scrutiny introduced waste types and site licensing. The following plan shows how a substantial part of the Albright and Wilson site, had been taken over by their Western neighbours. 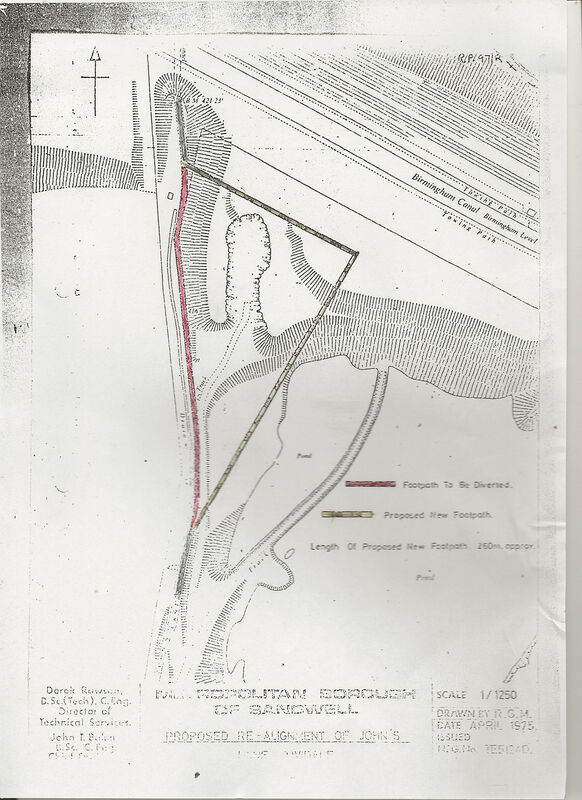 It also shows how the subsidiary lagoon, (carved from the original single pool), was carved up and buried underneath the new John’s Lane, with a further piled up section running parallel, which now forms the Western boundary of the Rattlechain lagoon site with the subsidiary lagoon. 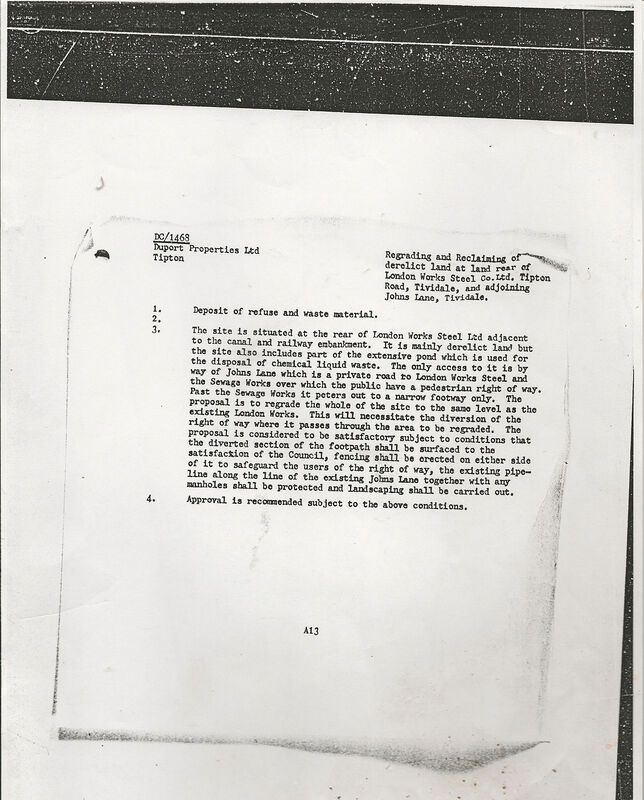 THEREFORE THE LAND DIRECTLY UNDERNEATH THE CURRENT JOHN’S LANE AND THE WESTERN EMBANKMENT ITSELF IS HIGHLY CONTAMINATED WITH MATERIAL THAT WAS DUMPED FROM ALBRIGHT AND WILSON’S SITE OPERATIONS. WE BELIEVE THIS IS A MAJOR PART OF WHY RHODIA DID NOT COVER THE SMALLER SUBSIDIARY LAGOON IN THE SAME MANNER AS THE LARGER LAGOON DURING THE WORKS OF 2013. THEY ARE TRYING TO ESCAPE THE HISTORIC CONTAMINATION LEFT ON THIS BURIED WESTERN BOUNDARY, SOME OF WHICH IS OUTSIDE OF THEIR CURRENT OWNERSHIP. None of this however appears to have been considered by officers of Sandwell council, who during these planning applications again fail totally to address concerns of the historic toxic pollution of the area up to this point. The conditions attached to the approved application are so weakly worded as to be meaningless. It is difficult to see how the users of the right of way would have been protected from the contamination below them during this operation. 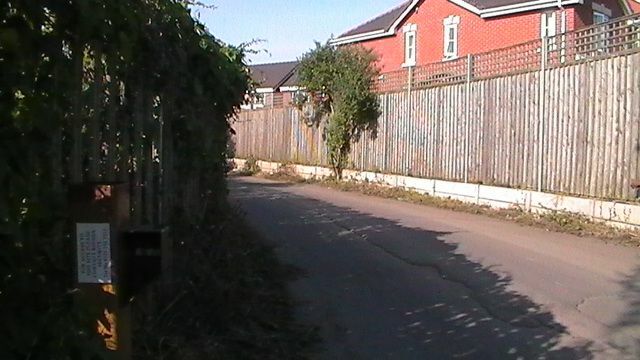 Furthermore it is revealed that a 2006 modification order deleted the section of John’s Lane originally recorded on the Rowley Regis Definitive map. 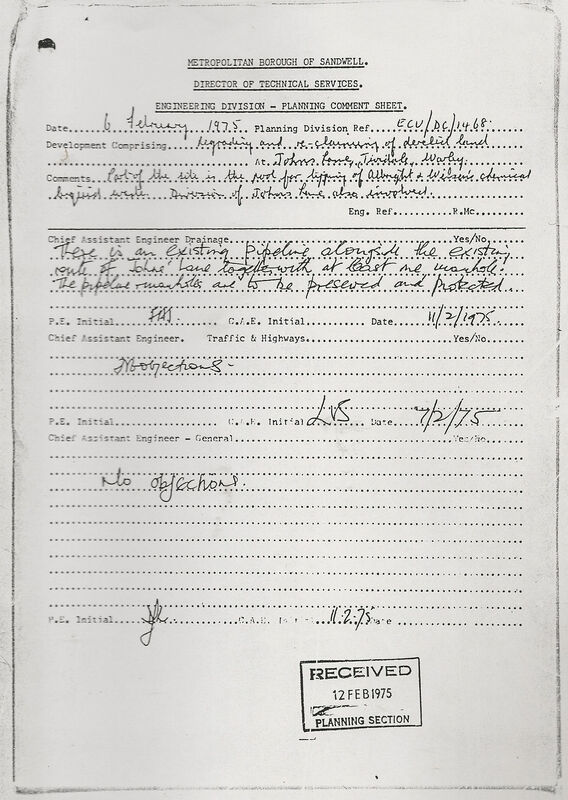 We show the original stopping up order below showing how the alignment was changed. The map below dated April 1975 shows both the ROW diversion and the detailed view of the kidney shaped subsidiary lagoon. It is clear at this point that Albright and Wilson decided to reshape this lagoon into the parallel running John’s Lane version as it appears today. 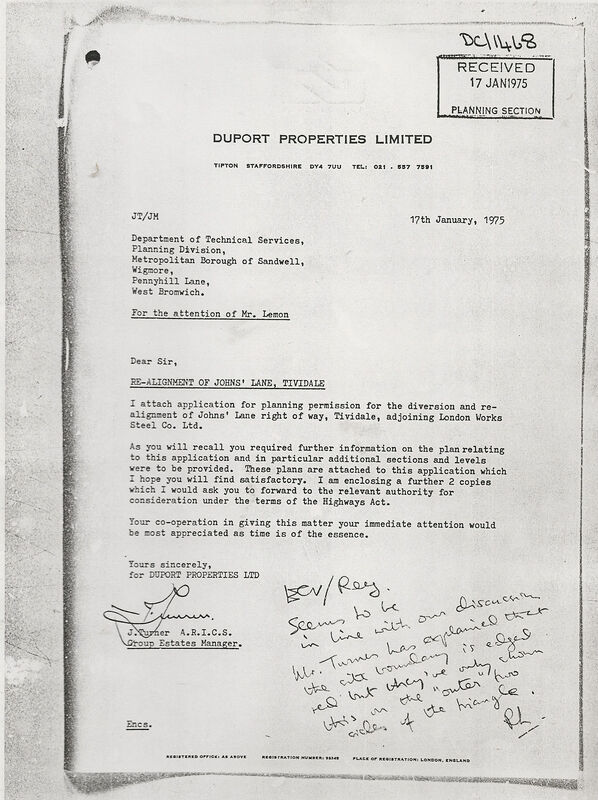 There is however the small matter of how and by what means and methodology this was achieved,though it is likely that Duport Property Limited were granted some tipping right onto the pool to form the new embankment. We seriously question the legitimacy of this latter companies operations in this area with regard to waste tipping, not only on this site but that which took place in “the new marlhole” on the former Rattlechain Brickworks site. Indeed their so called “Duport’s tip” was nothing more than a tatter dumping cowboy free for all fest operation, conducted with the most outrageous lack of scrutiny by environmental health officers to a point when their integrity also has to be equally questioned. 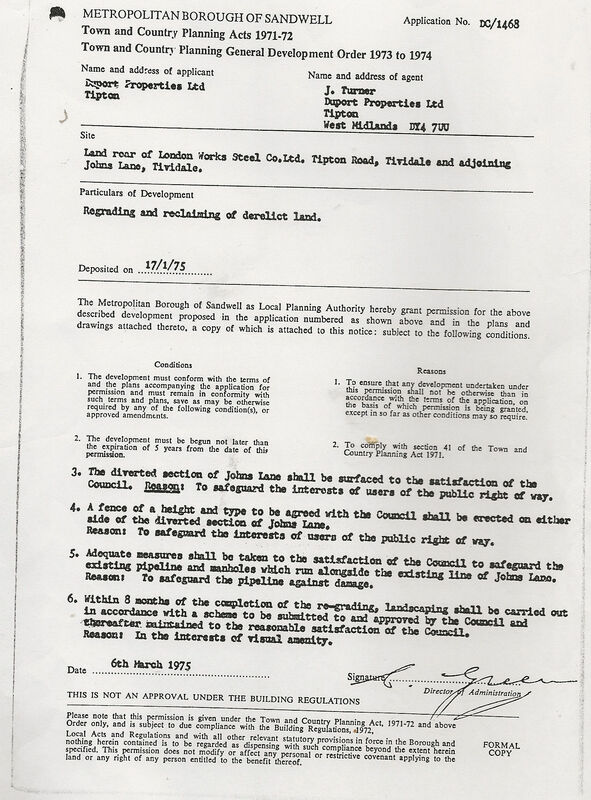 Through a landswap deal John’s Lane and that of a contaminated piece of land were allowed to disappear from the eyes of scrutiny; that is uptil now. HOW TO BURY TOXIC WASTE- THE FAVOURITE PASTIME OF ALBRIGHT AND WILSON AND DUPORT PROPERTIES LIMITED. 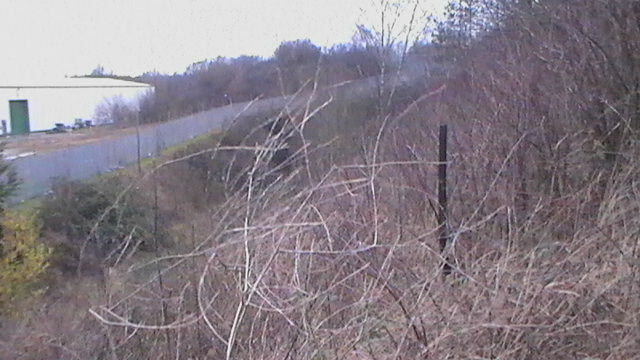 It is possible to still see some of the former Albright and Wilson owned land that once formed part of their Rattlechain dumping site. 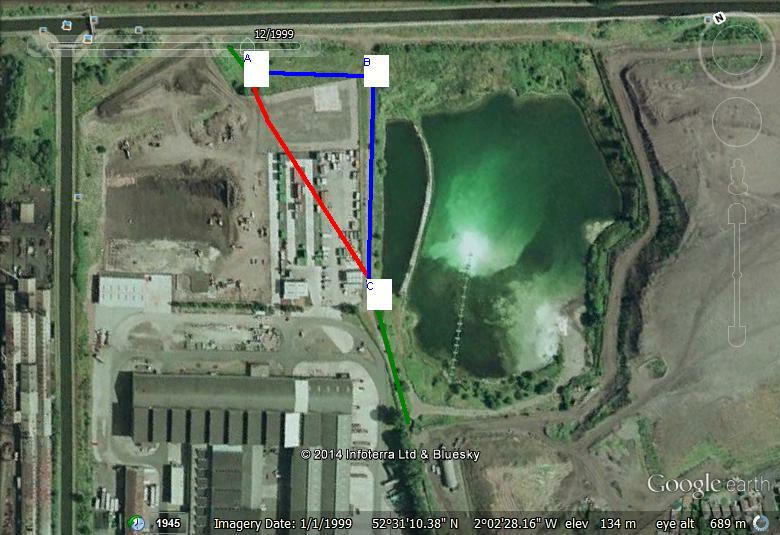 The red line below shows the former John’s Lane route across the Autobase site, with the blue line the current diverted section. 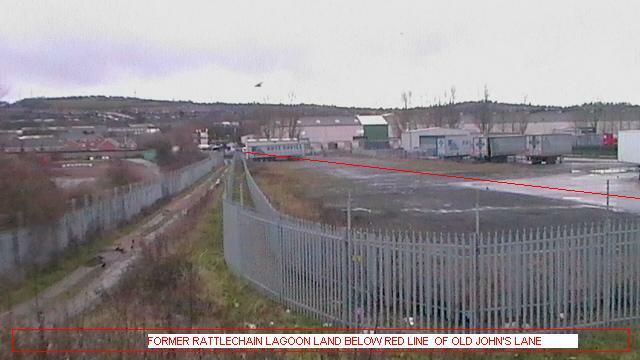 The picture below shows the approximate point at which John’s Lane veered across from point C, which would have been part of the rattlechain site before the diversion.To the left the now fenced off Autobase site and the right the rattlechain lagoon fence. The new diverted BC line which takes a sharp left. A path also continues to the Birmingham Canal. The new line heading towards the tunnel AB. 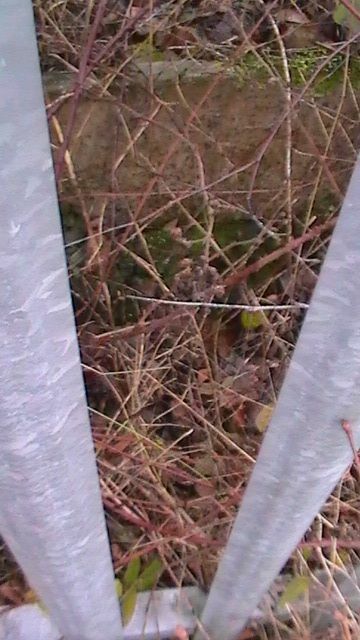 It is also possible to find some of what appears to be the former Albright and Wilson site boundary posts. 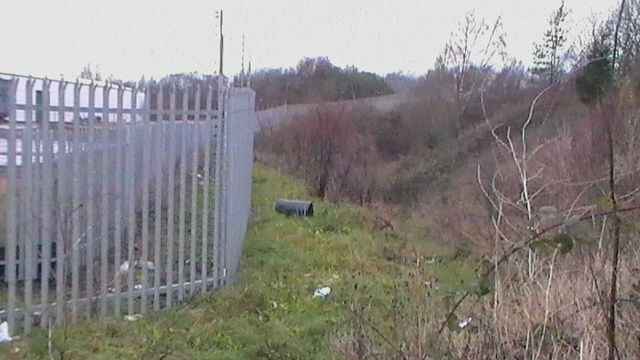 Parallel postline runs along the side of the canal embankment, level with the line of the rattlechain fenceline. The treeline also indicates that the site once formed part of the Albright and Wilson owned land. Same post looking towards the tunnel. 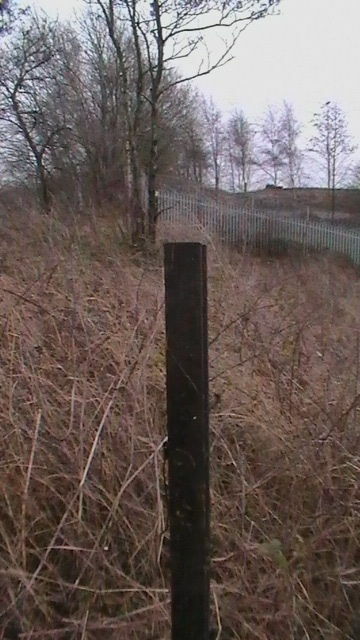 The picture below shows the former panelled fencing erected by application DC/837 which constantly broke. On the right the Autobase fenceline erected without any apparent application shortly before. 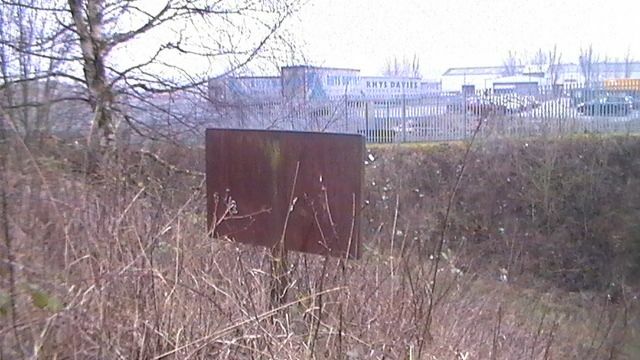 A view of John’s Lane before the houses were built on the former sewage works is shown HERE dated 6/1/2000. 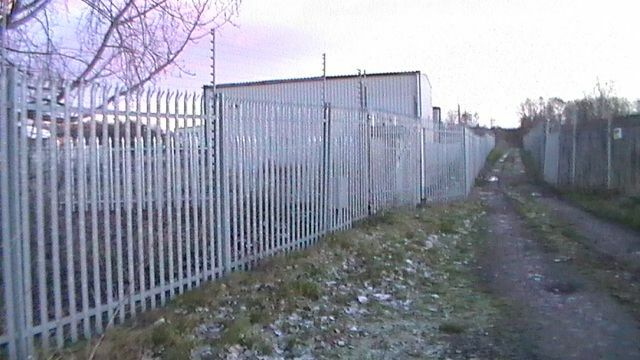 The picture below shows the new metal fencing installed by Rhodia in 2008. In front of this the old fenceline of the panelled fencing. This shows how they have pinched around 1 foot of John’s Lane back into their site, reducing the width of the highway- cheeky buggers! 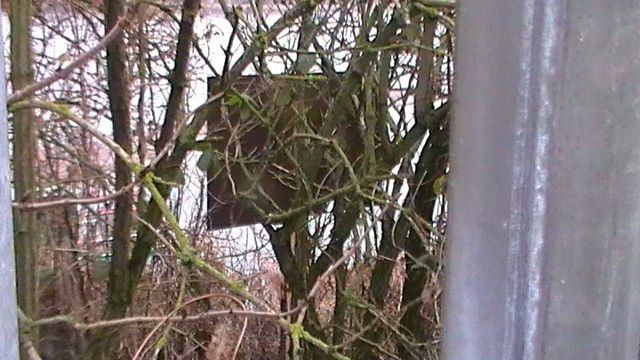 It is also possible to find a long rusted old sign poking out of the embankment. One can only guess what warning it gave, though it would be unlikely to say anything concerning white phosphorus. Another still located on the rattlechain lagoon Western embankment is of similar eroded vintage. In 1990, a new sewer network was laid along the line of the current John’s Lane, where it subsequently follows the sharp left turn towards the tunnel and into the River Tame outfall on Sheepwash Local Nature Reserve. Another private sewer remains on the Autobase site. One can only guess at the lack of attention given to what contamination was moved or overtopped at this point, but we see frequent pollution problems arising along this line, which unfortuantely neither Severn Trent Water or the Environent Agency have ever seemed to confirm the source. A prosecution might be nice. 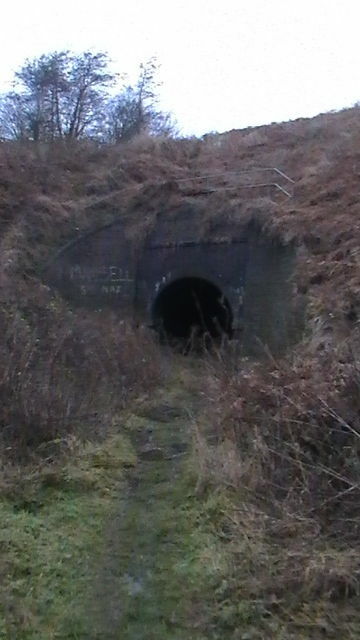 The tunnel underneath the canal and railway line continues the course of the right of Way of John’s Lane through to Sheepwash Local Nature Reserve.